the Undergraduate Certificate in First Year Foundations at Thomas Edison State University. There are different assessments depending on the qualification you choose illustrated by the blue and green arrow pathways in the graphic below. Successfully complete the four Edubit micro-credentials assessed by Otago Polytechnic. 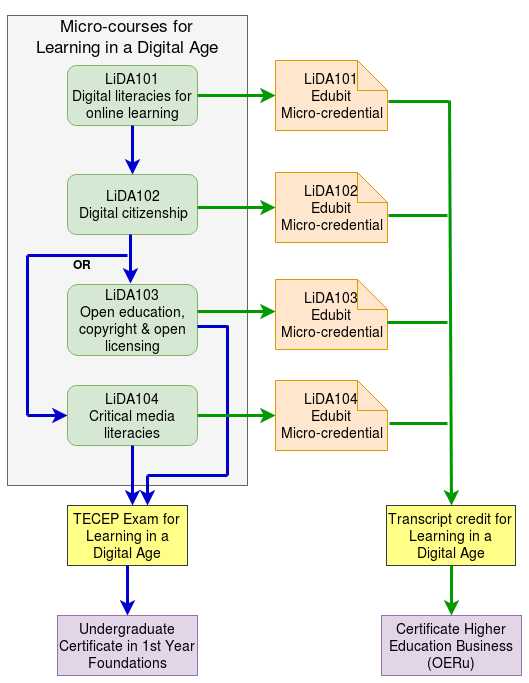 Request transcript credit after completing the four Edubit assessments for Learning in a Digital Age from Otago Polytechnic for credit transfer to the University of the Highlands and Islands. Successfully complete the remaining courses for the Certificate Higher Education Business (OERu) and apply for the qualification. This is illustrated by the “green arrow pathway” in the graphic above. Successfully complete the TECEP examination for Learning in a Digital Age administered by Thomas Edison State University. Successfully complete the remaining courses for the Undergraduate Certificate in First Year Foundations. This is illustrated by the “blue arrow pathway” in the graphic above. Learners may choose to complete Edubit assessments for individual micro-courses. These are small enough to be manageable for busy people, but big enough to be meaningful to employers. Associated Edubits for the Learning in a Digital Age course are “stackable” because they can be applied for transcript credit at a later date should learners wish to pursue the Certificate Higher Education Business.